- Written specifically for the high school market. - Science has been simplified. - Updated techniques, practices, and procedures. - 4-color design improves accessibility. - HS Lab Exercises contains accessible, fun, inexpensive, and safe labs. - Written by an expert and renowned authority in forensic science. - Computer Forensics chapter - Hot Topic! New! MyCrimeKit - is an online supplement available separately that offers book-specific content such as Learning Objectives; Chapter Summaries Flashcards Practice Tests,Video Clips, Web Extras, and Animations Activities! 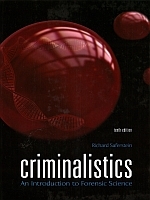 This book aims at making the subject of forensic science comprehensible to a wide variety of readers who are planning on being aligned with the forensic science profession.